The New Zealand Tree Project is an innovative film and photography project that shares imagery of majestic trees and native forests from viewpoints that are rarely experienced. The goals of this nonprofit project are to share the wonder of our natural world and ignite interest and action in nature conservation. We have used cutting-edge techniques to create unique images and footage of New Zealand forest that are presented as a spectacular Rimu Portrait, a captivating documentary and a gallery of striking images. Fancy owning a copy of the Rimu Portrait? Visit our store to see a range of options that will not only enhance your wall space but also support the non-profit education and awareness goals of the New Zealand Tree Project. While working on the Rimu Portrait in Pureora Forest, our team were inspired and moved by the stories that were shared with us. Not many people know about the incredible and dramatic events that have taken place in Pureora so we decided to make a short documentary to capture the amazing natural and human history of this area. "On the Shoulders of Giants" shares the raw perspectives of loggers, iwi, scientists and conservationists as it journeys through the Pureora story of forest discovery, degradation and then protection before finishing on a high from the tree tops with never-seen-before footage from New Zealand’s forest canopy. The goal of this documentary is to share some of the wonder we experienced in Pureora Forest in hopes that more people will visit and protect our unique natural areas. We hope you enjoy! Our professional tree climbers completed more than 100 hours of climbing during the project. Their experience, patience and love of the canopy enabled the team to access even the furtherest reaches of the canopy. Our photography and film crew created more than 120,000 images, 1200 video clips and 28 epic time-lapse sequences during the production. The team's creative imagination really drove this production. Our canopy scientists provided unparalleled scientific support and organisation to the team. Their talents and dedication to canopy science delivered several key elements to the production. Work commenced in Pureora Forest Park in early March 2015 and we were blessed to have a warm welcome from local iwi, who provided incredible support during our stay. The initial set up period was a lively time with eight of us working tirelessly to get all the equipment in place, including our main camera rig which took four professional tree climbers three days to install. The main camera rig ran the entire 40m height of the subject tree, which allowed us to take the series of photos that created the Rimu Portrait. Another exciting aspect of the project was the unique time-lapse footage that we captured with interesting perspectives. We custom-designed a 50m long cable-cam that we suspended from various places in the forest. Using the Syrp Genie (ingenious hardware that moved the cable-cam platform along the cables) we were able to capture both time-lapse and video footage. The team went to incredible lengths to install the cable-cam into far reaching parts of the forest. 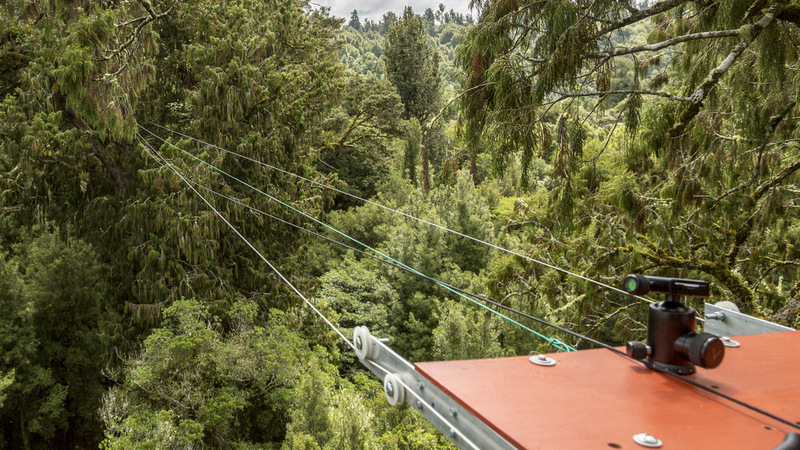 It took three days to set up the cable-cam between the canopy of one emergent tree to another, 40m off the ground and covering a total span 35m! We also interviewed scientists, protestors, former loggers and local iwi for our documentary that showcases the natural beauty and importance of the forest. This work shares the unique social history and ecological importance of Pureora, a forest not only rich in diversity and wildlife, but one that played a pivotal role in the conservation of forests all throughout New Zealand. We had the most incredible time in Pureora Forest and would like to thank all of the amazing people who helped to make this project happen. Steven is a renowned, award-winning photographer who specialises in wilderness and adventure photography. As an avid tree climber and a passionate naturalist, he has spent many years documenting forests, the canopy of trees and the scientists who study them. He has successfully run numerous expeditions, photography workshops and community outreach events. Catherine is the author of Field Guide to New Zealand’s Epiphytes, Vines & Mistletoes and the coordinator of the New Zealand Epiphyte Network. She has vast experience in New Zealand forests including tree climbing and plenty of epiphyte exploration. Catherine is also an Environmental Educator with a personal mission to re-connect people to the land and forests. 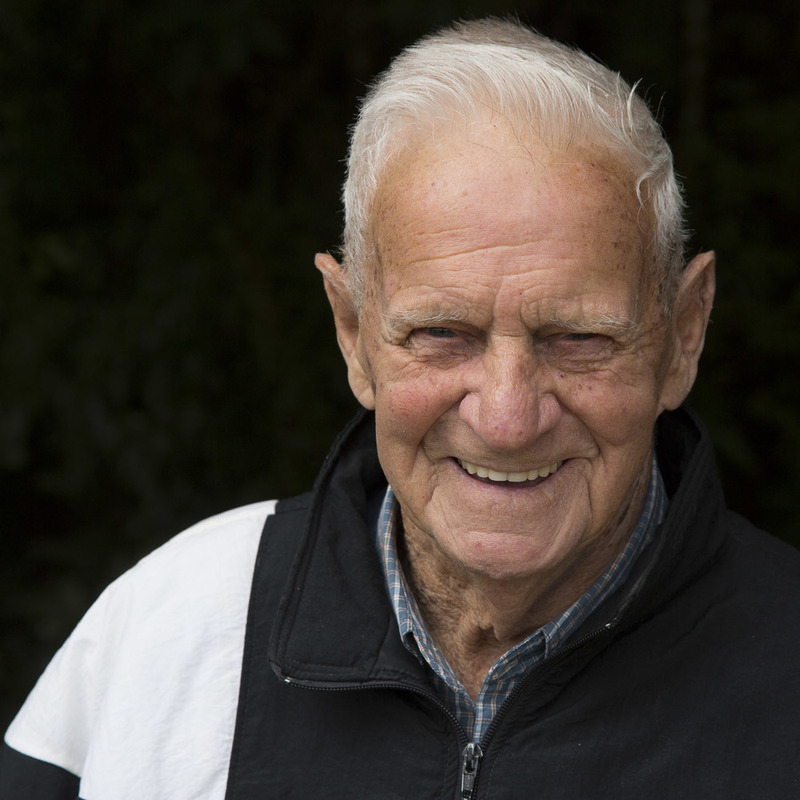 Three times New Zealand tree climbing champ, Andrew is a keen adventurer who has climbed significant trees all over New Zealand and the world. Andrew is a member of the arboriculture academic staff at Wintec and is well renowned for his contributions to international tree climbing and arboriculture industries. Jennifer is a passionate plant ecologist who has spent many years studying rainforests and the charismatic plant species which inhabit them. As an epiphyte ecologist and passionate tree climber, she has spent countless hours exploring the canopies of rainforest trees. Highly organised, she has successfully run many field expeditions in various locations around the world. Our Go-To video and photo man, Mitchell was on site for the big events and proved indispensable. Very capable of having a laugh while getting the job done. Fiona spent several days on site and provided us with essential logistical and moral support. Her passion for forest conservation is second to none. The forever-smiling Rachel was essential relief from 'the bush crazies'. She gave us her valuable time and baked some incredibly delicious cakes! Tim's climbing expertise was essential for setup but the scone critique was a bonus. James put in many hours during the setup period and was vital for rigging one of the main trees. Anika is a highly skilled climber and her help was crucial during the setup period of the project. Paul was on site for the pack up and also went the extra mile to help with other project aspects. The NZ Tree Project team are focussed on increasing the awareness and understanding of our amazing forests with people of all ages. We believe that people will only protect what they care about and only care about things that they understand. It is a simple recipe that has seen great results! The scope and scale of our education programme will be dependant on funding. If this sparks your imagination please get in touch; we'd be over the moon to receive content suggestions or hear about funding opportunities. Simply email us: nztreeproject@gmail.com.